Since 1973, 155 people have been exonerated from death row in the United States. 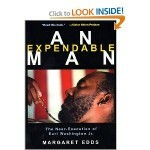 Virginia has exonerated one person, Earl Washington, Jr. An Expendable Man, Margaret Edds’ excellent book about the Earl Washington case, demonstrates how alarmingly easy it is to get confessions from innocent people and then sentence them to death. Read the executive pardon petition prepared by his defense attorneys. Visit Witness to Innocence, the national organization of death row exonerees, to hear the stories of men and women wrongfully sentenced to death. Visit the Death Penalty Information Center for the latest information on the cases of the exonerated.